A good property management company stays ahead of surprises and ensure the health of their buildings is maintained at optimal levels. 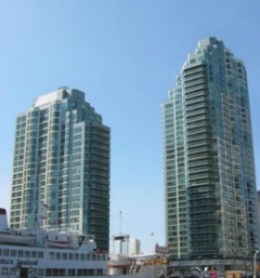 These beautiful buildings are right at the waterfront at the start of Toronto's Yonge Street. A heating fuse clip connection was noted in one of the booster pump control panels. Trouble with this component was identified before a failure occured. Murphy's law suggests that electrical failures inevitably occur in the middle of the night, on the weekend! Bring infrared thermography to your building and prevent unexpected breakdowns, fires and equipment damage.